Disney resorts are known to be the most fun getaways you can have, especially for kids; this is no exception to the All Star Resorts. Chock full of activities, tons of amenities and a ton of dining and entertainment options, you will never be disappointed. Enjoy this fantastic sports themed resort hotel that adds the world of competitive sports such as Baseball, Basketball, football, tennis and surfing taking it to a whole new level of fun. In the All-Star Sports resort Hotel, it’s about enjoying the sports, the atmosphere, the Disney characters to complete your experience in a truly magical sporty world. Step up your game as this Champion of a resort is geared up to compete with the rest! Find some of your favourite characters working up a sweat around the grounds. This resort features Tennis, Basketball, American Football, Baseball and Surfing, complete with sports themed pools you’ll soon be a big fan. There’s a lot of food options at Disney’s All Star Resort from an array of fresh food to the convenient and mouthwatering room delivery, with this menu you’ll be spoilt for choice. End Zone Food Court – Here to provide breakfast, lunch and dinner, it’s a place where people lineup for their delicious and scrumptious burgers, hotdogs, pizzas and pastas, smoothies and gelato. It’s all the fun under one roof. Grandstand Spirits Pool Bar – Something exclusive for the adults. This cool hangout by the surfboard Bay Pool is a great place to relax and take the edge off. Disney Resorts Pizza Delivery – This dine-in pizza delivery service is for you to enjoy in your hotel room, eat some scrumptious pizza’s with your friends and family. 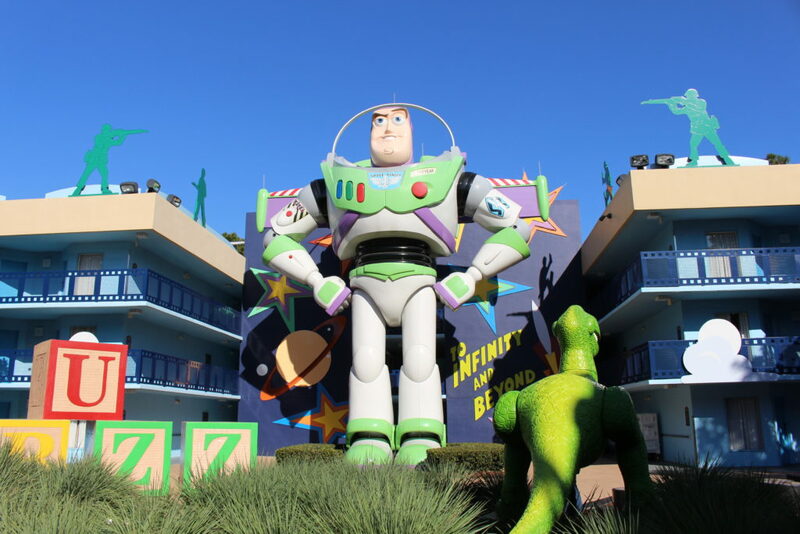 Disney fans, young and old, Disney’s Movie Resort is the place where you can enjoy everything from classic Disney Cinema, to the modern characters, this place will make you enjoy every second. With the larger-than-life décor, the cute Disney themes and the very hearty Disney atmosphere, it’s the place fit for adults and children alike. Share your stay with some familiar larger than life movie legends in this fun filled resort. Consisting of five fabulous themed areas you could get a whole lot of “puck” for your buck with the Mighty Ducks, be right in the “spot” light with 101 Dalmatians, rev up your adventure with Herbie the Love Bug, travel “to infinity and beyond” with Buzz, Woody and the gang from Toy Story, or simply have a magical time with Sorcerer Mickey in Fantasia. Word Premiere Food Court – Breakfast, lunch, dinner and late night foods, this place is where the fun happens, a great place to eat delicious meals any time of the day (or night). Disney Resorts Pizza Delivery – Want to stay in your hotel room? Pizza awaits! You can get pizza delivered to your hotel room for dinner and late night cravings. Music lovers will be in their element at this fun and colourful resort. It offers something to suit everyone with Calypso, Rock ‘n’ Roll, Country, Jazz and Broadway-style genres. You will find gigantic music inspired tributes around the grounds and the fun of song and dance infuses not only into the rooms, but also into the two fabulous pools. So don’t forget to pack your dancing shoes!! World Premiere Food Court –This restaurant serves breakfast, lunch and dinner. Disney is the king of entertainment, and their All-star hotels are no exception. With a massive focus on family fun, there’s no doubt you’d want to come here every vacation. Have you ever been to the All Star Resorts?